Not long ago I reviewed an imaginatively constructed recital disc of violin and piano sonatas entitled Identity (Ars Produktion ARS38189). The violinist was Noé Inui, the performer here. What impressed me, apart from the quality of the interpretations, was the rich burnished sound, wealth of colour and tonal shadings not to mention the consummate polish and refinement of his artistry. His collaborator there was Mario Häring. Here he performs with the Greek pianist Vassilis Varvaresos, on this their first venture. 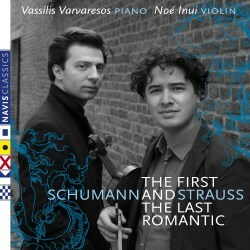 They have chosen the Strauss Sonata as they have lived with the work for a while since taking it on tour in the States. This gave them the idea of recording it; so what to choose for a companion piece? Schumann’s Second Sonata seemed to fit the bill, a work suitable to stand shoulder to shoulder with the orchestral dimensions of the Strauss Sonata. Schumann’s Second Sonata was composed only a few weeks after the First. The composer was disappointed with his first attempt, later writing "... so I wrote a second, which I hope turned out better". Completed between October and November 1851, but not published until September 1853, it was dedicated to Ferdinand David of Mendelssohn Violin Concerto fame. Its first public performance was given in Düsseldorf by Clara Schumann and Joseph Joachim. Indeed, Clara took to it immediately, finding the work "wonderfully original, with a depth and magnificence that I have hardly ever known before". It’s character couldn’t be more different from the First Sonata, Schumann replacing brooding melancholy with a more upbeat, exuberant and energetic focus. The opening Ziemlich langsam – Lebhaft has plenty of drama and attitude, is potently assertive and passionate, yet is generous on ardent lyricism. The positive, upbeat and sunny character of a Brahms-like scherzo movement follows. Then comes a set of variations based on a chorale recalling Bach’s Gelobet seist du, Jesu Christ. Inui’s exquisite, fulsome tone has a beguiling luminosity. At one point, he plays with his bow very close to the bridge, achieving a diaphanous otherworldly character; it’s these imaginative touches which add that extra fillip of tonal lustre to the proceedings. The finale has emotional urgency and lusty exuberance, and proves to me that there is an evident rapport between the players, each meeting the technical challenges with stunning virtuosity. Listening to this compelling performance helps dismiss the strongly held belief by some that the violin sonatas show a composer lacking inspiration in the final years of his mental decline. Rather they are brilliantly constructed, offering both ingenuity and compositional flair. I prefer this second venture to the first for its grander scale. Whereas the Schumann Sonata is a late work, Strauss was in his early twenties when he composed his Violin Sonata between 1887 and 1888. Whilst working on it he fell in love with Pauline de Ahna, the soprano who later became his wife. Optimism, hope, anticipation and youthful exuberance inform the bold virtuosic writing. It was Jascha Heifetz who championed the sonata and helped raise its profile. He made two commercial recordings of it and included it in his last recital in 1972. Strauss exploits the technical prowess of both the violinist and the pianist to the full, with both players here rising to the challenge admirably. Their familiarity with the music certainly shows itself in the subtle detail they bring to phrasing and dynamics. Inui’s intonation is impeccable, and his large-scaled playing, varied vibrato and tonal variance are a positive asset in a canvas such as this. Whilst there is drama, passion and muscularity in the outer movements, it is the central Improvisation: Andante cantabile which is exceptionally stunning. The violinist’s tender and heartfelt playing could scarcely be bettered. The muted section in the middle is truly improvisatory, with the music seeming to be created on the wing. Varvaresos’ lithe, gossamer accompaniment here evokes an atmosphere of halcyon calm. Superbly recorded, these impassioned and committed accounts are outstanding and thoroughly convincing, with a natural balance struck between both players. The booklet includes an interview the violinist gave to MusicWeb International reviewer Dominy Clements in which he discusses the genesis of the recording project. This is an outstanding release that will certainly repay repeated listening.